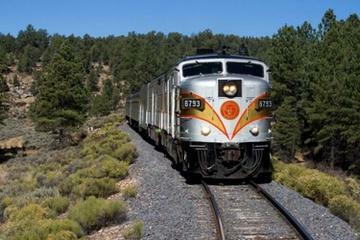 All Aboard Arizona Train Tours! All ABOARD! Travel Arizona train tours and discover what it must have been like back when these vintage cars made their mark on history. Experience these excursions and learn just how important the railroad was to Arizona. 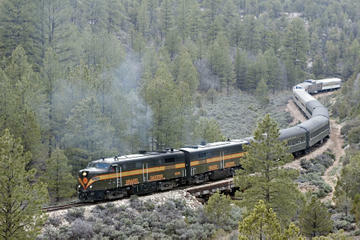 You will feel you have stepped back in time as the tour travels on the Grand Canyon Railroad. Enjoy your ride on one of these very comfortable cars while your knowledgeable tour guide provides just the right amount of interesting information along some of the most remarkable and memorable picture perfect countryside you may have ever seen. The views on this excursion will have you gasping and likely already planning your next relaxing scenic Arizona train trips! This tour will provide you with some of the most scenic views along with some of the most interesting history… how’s this for size? The train makes its way to the only remaining log depot still in operation, known as the 1910 Grand Canyon. This 1.5 hour tour will provide you with many artifacts about the area along with some of the most stunning views overlooking the rim of the Grand Canyon as well as views of the San Francisco Peaks. And just because it is only an hour and a half in length, don’t count on a boring ride with this selection! 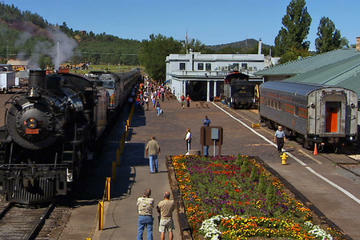 This just may be the perfect selection for your group of the Arizona train tours options. Not too long and not too short… Listen to the onboard strolling musicians who will have you singing right along with them. This selection also includes recreations of traveling on a train which, as you might guess, include an Old West train robbery back in the early 1900’s. You just might consider this the “Grand Daddy of them all” when you consider you are getting three full days of the Sonoran Desert which includes plenty of panoramic views of some of the most sought after attraction sites in the entire state. You’ll be stepping back in time as you travel the original path of this historic railway line. Arizona train rides do not get any better than this selection as far as the inclusions as well as the extras that you can add on. You also have the option of adding on a helicopter and Jeep tour, too!